Du Apps Studio, the developer of the popular Speed Booster and Cleaner Android application had launched a new Du antivirus app on the Google Play Store in 2016. According to the firm, the Du antivirus was ranked #1 by AV-Test in September 2016. For those who aren’t aware, AV-Test is an independent organization that rates security products. The app is popular because it has superb features. Here’s is the review which explains various modules of the DU security application. DUA is a small application. Hence, it gets installed quickly on the mobile phone. DU antivirus doesn’t waste your time by showing annoying slideshows and popup windows. It gets into action immediately after you install and run it. DU Antivirus scans the executable file of each app installed on your Android device. The application does this everytime you run it on your mobile device. Apart from detecting viruses, the application checks system clipboard. It also makes users aware of apps that are generating log files. If the clipboard has sensitive information, DU Antivirus will display an option to clear the content of the clipboard. 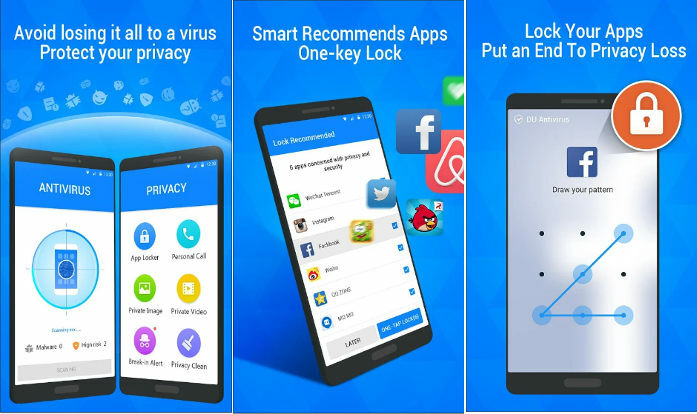 App lock: This tool of Du antivirus allows you to lock Android applications. Private video: This utility enables you to hide personal videos. The app finds videos automatically on your device and lists them in an interface. You must select the video files which you want to hide. Once you do so, DU Antivirus will ask you to set a pattern lock. Break in alert: This feature is similar to the intruder selfie feature found in other Android security apps. Private call: This utility of the Du Antivirus app for Android ensures that the call records of certain numbers are not displayed to unauthorized users. Antivirus settings: This interface allows you to add applications to the ignore list. It allows you to turn on/off the automatic update of virus definition. It provides an option to enable real-time protection and update virus definitions manually. Call blocker settings: With this interface, you can enable automatic call blocking feature. DU Antivirus refers the database of the DU caller app’s common spammers. It discards calls from the numbers which are present in the database. Du Antivirus can block calls from the phone numbers which aren’t present in the phonebook. Security status security notification: The displays the system protection status on the notification bar. You can disable the status from this interface of DUA. DU Antivirus is yet another great application from DU Studio. Apart from protecting your mobile phone from malware and viruses, the app comes with several security features.